Does anything beat flipping casually through the Sunday paper, only to see a positive client story you’ve spent three months coordinating finally published? Actually, yes. While print is still critical, and has its own advantages, online placements with strategic backlinks are PR gold in today’s digital age. Now, before you balk at this statement, thinking “oh, you silly millennial,” hear me out. They help you reach an entirely separate group of readers. They provide executives with a tangible PR success that can be passed around board meetings. And, in many cases, there’s still a large print circulation for most outlets. But to really prove PR value, think beyond the one-and-done placement approach. 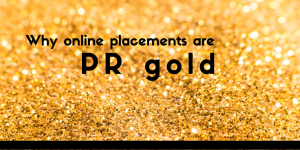 Instead of just being known for securing big placements, be the PR pro known for securing placements that continuously reach target audiences while simultaneously furthering clients’ digital marketing goals. And that’s where online placements come into play. When your clients have quality backlinks to their websites from trusted, high-traffic sites, they have a better chance of ranking on the first page of Google for important keywords. In most cases, SEO firms work on developing backlinks for companies. But there’s one integral piece missing from many SEO professionals’ backlink strategies: Effective media relations. Pitching and placing stories, like we do every day, is the best way to get high-quality, “safe” links from major publications. No black-hat link buying necessary here. Securing backlinks via media relations follows the traditional PR mindset (pitch the right story to the right journalist). But, in this case, you’ll want to focus on stories related to keywords that are important for your brand. For example, pretend you’re a running company and your unique selling proposition is shoes that prevent injury. You’ll want people searching on Google for running injury solutions to find your company because they’re prime prospects. You’d want to rank for something along the lines of “running shoes to prevent injury.” But, to rank for that, you’d need a mix of on-site content, social media posts and media placements surrounding this topic. That’s when a strategic online placement in Runner’s World, highlighting you as the expert on how to find the right shoes to prevent injury, will be a great SEO tool. It has you on a high-authority site linked with an article related to your specific keywords. This strategy works across industries. To find your clients’ prime keywords, follow this step-by-step guide from Gini Dietrich. Digital stories are more easily shared. Media stories provide valuable third-party credibility for clients’ products. Couple that with readers sharing the story on social media, and your possibility for influence grows drastically. Harris Interactive found that seven in 10 millennials are influenced by their friends’ social media posts. 80 percent of consumers will try new things based on friends’ suggestions, reports Market Force. So, back to our running example (Boston Marathon fever, anyone? ), when a reader shares an article about your shoes as the solution to running injuries, there’s a good chance his running friends will be enticed to learn more or buy those magical shoes, too. And the benefits extend beyond sales. Social shares help the journalist, too. Since journalists are now evaluated on virality of stories (in addition to content quality), the more your client’s story is shared, the better you’ll make the journalist look. How’s that for relationship building? Build a positive, long-lasting digital footprint. So, those online placements – while often downplayed as, “well it was only online” – can actually help us check off quite a few of these boxes. And, if you do find yourself in one of those gleeful “it ran online and in print!” situations, then congratulations! You, my friend, have a PR win-win.